26 entries categorized "Storage & Tools"
Hello, Friends! After moving into our new permanent home 9 months ago (we previously rented for 3 years after moving to this area, until we could get our old home sold and find the perfect new house) and getting fully settled into our house and my new craft room, I finally got things cleaned up and organized enough to show you my craft room! I find I usually need to live in and use a room for a while, to determine how I use it most and what works best -- how about you? It's been 3 years since my last 2014 craft room tour in the rental house, so come on in and let's get started! My room is an upstairs bedroom with south-facing windows. I LOVE all the natural light I get in here all day and gazing out at the tree tops, filled with birds and squirrels! Fortunately, our lot and the one next to us out these windows (currently vacant) are heavily wooded, so no other houses have a view in. I was able to use most of my furniture from our last home and rental house, but my previous dark brown desk was 10 years old and had seen better days! Plus, I wanted to go lighter and brighter and most everything white, so I chose two IKEA Linnmon desk tops (59" x 29-1/2") resting on IKEA Alex 5-drawer units, and attached to an old white dresser which started out 17 years ago in our oldest daughter's nursery, was previously used by daughter #2, but it didn't fit into either of their new bedrooms . . . Score for me! Above, you can see the top row of drawers of the white dresser showing against the back wall. I took the second row of drawers out of the dresser and attached the desk tops to the bottoms of the top drawer dividers (a better photo is shown below). I use the left desk for my crafty creating and the right side has my computer setup (and messy pile of papers!). Here's a look inside the "Towers of Embellishments". I have the tops of the drawers labeled, so I can find things easily. The labels really don't show much when the drawers are closed. They hold: Felt, Sequins, Inchie Art Squares, decorative tapes (washi), extra adhesives, tools. Below is the view from the right side desk back towards the entrance of the room. Behind my crafty desk is another furniture piece from my girls nursery, an armoire. Inside the armoire I installed shelves, which house my most-used stamps and dies in InterDesign Double Fridge Bins (another fabulous Jennifer McGuire storage system). 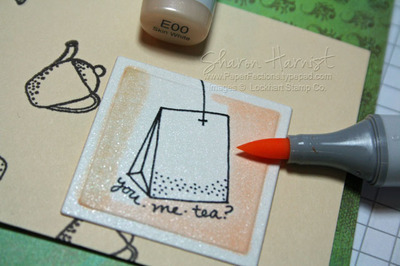 You can find more specific details on my blog post HERE for stamps, and HERE for dies. Above, I have cling-mounted Taylored Expressions stamps (left) organized in one Double Fridge Bin, sorted by categories. The right bin holds TE dies. I store the stamps and dies in Avery Elle Stamp & Die Storage Pockets, either Large or Small. The category dividers I use are these white laminated Storage Panels, cut in half. Some of my older tabbed dividers are no longer available, but I've started using these Tabbed Dividers and cutting them in half. Above, Ellen Hutson's Essentials by Ellen clear stamps and wafer thin dies come already packaged in these fantastic thick Storage Envelopes, either Medium or Large. <-- You can purchase these individually, if you want to re-package your existing stamps and dies! I have stamps and dies mixed together in the "Ellen Bin", since so many of the stamps have coordinating dies. The lower drawers of the armoire hold 6x6 patterned paper pads and more adhesives, Xyron machines, etc. On the wall opposite the windows (to the right of the doorway when walking in) are my (very) old white stackable modular Store In Style 15-inch cubes by Crop In Style, which I don't believe are being made any longer (Internet searches don't find any in stock). They are similar to the Jetmax storage cubes carried by several different stores. They have held up very well over the past 12 years and through five moves! I love that they can be configured to fit any space. My photography lights are set up on the end -- (I'm still not completely satisfied with this system and am looking for something that takes up less space). This is where my die cutting station is set up. They are also stored in the Double Fridge Bins, divided by categories. Stencil tools and stencil pastes are stored with the stencils. Now the view of my crafty/stamping desk. The cute owl planter holds paint brushes. On the left side of the desk is my can't-live-without paper trimmer. Front and center are my beloved Copic Sketch markers! In the background behind my computer desk are closets that run the full length of the room, filled with more crafting and office supplies. Between the closet doors are two stacked IKEA 4x4 shelf units (with doors) which hold printer paper and cardstock, printer labels, mailing supplies, printer, and Silhouette Cameo. It holds scissors, tweezers; hole punch, corner chompers, crop-a-dile, mini stapler, stamp spray cleaner, water and alcohol spray bottles, gel pens, water brushes. For my Copic markers I prefer an open-shelf storage system. I don't like having to take the time to position each marker into an individual hole/space -- it makes cleanup much faster and easier (and more likely to happen, LOL!). Unfortunately, the right five "Color Cubbie" towers are no longer being manufactured. More about the left tower is detailed below. On top of the marker units I have displayed recent/favorite card projects using harp clips. A close-up view below shows how I've divided my Sketch markers into color families -- two shelves for larger families (shown on the right below). The left tower unit is a newer storage solution I've found and which I'll be getting more of whenever I may need more storage for either markers or Various Ink Refills. It is the Marker Nook by Stamp-N-Storage. Most of Stamp-N-Storage's storage solutions come in a natural wood, which can be painted or stained. I painted mine white. It houses my alcohol-based hand sanitizer (for cool Copic effects and clean-up), Aristo Mechanical Pencil and Click Eraser, Copic Opaque White, Kirarina WiNK Pens, Zig Wink of Stella brush markers, and Zig Clean Color Real Brush Watercolor Markers. 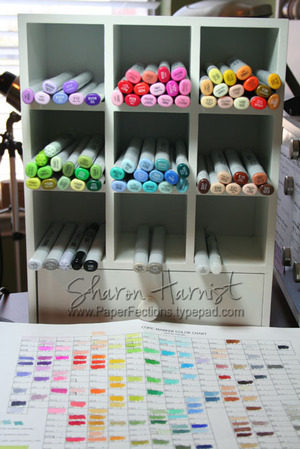 How do you prefer to store your markers? Below is a better view of how my desktops are attached to the dresser. Since the second row of drawers had to be taken out in order to attach the desktops, this left easy access to house my Copic Air Compressor for the Copic Airbrush System, heat embossing gun and Heat It Craft Tool. It houses more of my most-used supplies, within easy reach: Acrylic stamp blocks, Misti Stamping Tool, embossing powders, mini ink cubes in mini ink storage tins, other paper trimmers and punch boards, scoring boards and self-healing craft mats. In here are my beloved X-Press It High Tack Foam Mounting Tapes (two widths), X-Press It Double-Sided High-Tack Tape rolls (two widths), Clear Gel Glue, Glue Marker and Glue Pen, and Tape Runner, all within easy reach. Last, but not least, are my ink pads. They are housed in my favorite storage solution I've found to date, the Distress Combo 48-Holder from Stamp-N-Storage. These units come in a natural wood, which you can stain or paint. I painted mine white. They are elevated on some aqua storage shelves, sitting on the glass-topped white dresser on the back wall of my room. The units can also be hung on the wall. Down on the other end of the dresser is a lamp and radio/tune-player. They easily hold most types of ink pads, up to about 3-1/8" wide: Full-size Distress Ink Pads, Memento full-size ink pads, Ranger dye ink pads, etc., along with their Refills and Markers! Thanks for stepping into my craft room today! If you have any questions, please feel free to leave them below in the comments and I'll answer as quickly as I can! Things We Love 2015 plus DISCOUNT code and GIVEAWAY! Hello and welcome to a new feature this year ... “Things we LOVE 2015” with Ellen Hutson LLC! I am so happy to be here sharing some of my favorite papercrafting supplies! 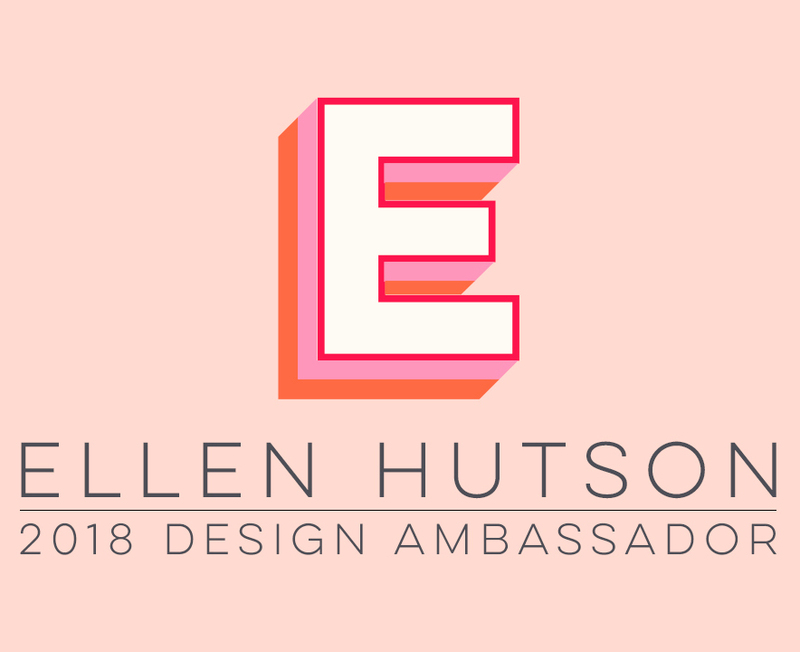 Over the next few weeks the Ellen Hutson CLASSroom designers are all sharing the things we love most and just for my readers, I have compiled a list of loves AND I have a special discount code to Ellen Hutson LLC for you to use! I am thrilled to share my exclusive discount code for you to enter in the coupon code area of your shopping cart at check-out: “thinkgswelovesharon” will save you 10% on EVERY in-stock product through December 14 over at Ellen Hutson LLC! The discount is NOT limited to just the things I love, but ANYTHING you love, too, as long as it is in stock! (So shop early for the best selection)! I tried to narrow this list of the things I love to the 4-5 supplies I use daily or reach for regularly. It was really hard for me to keep the lists short! If you have any questions about any of these items, please email me using the link under my photo. Stay tuned to the end of this post for a huge GIVEAWAY just for my blog readers! X-Press It Foam Tape: I use this foam tape on EVERY paper project I make ... It always amazes me what a huge difference popping something up on foam tape makes in creating depth and interest to a project! It comes in 1/2-inch and 1/4-inch widths, to fit any size you may need. It is on one continuous roll, so you can cut it to the size you need. The foam is more dense than any other I have found, which means it won't get as squished when going thru the mail. EXTREMELY good adhesive stays PUT! Check out the price per foot, too -- You probably won't find another foam tape at a better cost! Tombow Stamp Runner: This is my favorite tape runner for adhering paper together. It is the dotty kind, so you won't see bits of it hanging off the edge of the paper if you get it too close to the edge. Holds extremely well, even in the high humidity where I live. X-Press It Double-Sided High Tack Tapes: Come in 1/8", 1/4", and 1/2" rolls. These are great for holding heavier cardstock or cardstock that has been dry embossed and has an uneven surface. They are also fun to make accent strips with -- apply glitter to them or pour embossing powder on them and heat emboss! X-Press It Glue Markers & Pens: I usually use these to adhere smaller/thin die cuts. The smaller tips make getting glue into/onto small items a lot easier! Glue Dots: Great for adhering any three dimensional embellishment, heavier paper, or photographs to paper and works well on altered projects, too. Roll them up for just a little added dimension, when foam tape gives too much height. High Tack Double-Sided Tissue Tape, 1/2"
Inchie Arts Art Squares: High quality sturdy matboard pieces that stand up to any kind of medium you can think of -- embossing pastes, watercolor, heat embossing, dry embossing, inking, airbrushing, Copic coloring, etc., without warping! Comes in sizes: 1", 1-1/2", 2", 3", 4", 2-1/2" x 3-1/2" (ATC), and 2" x 4", white and different colors. Essentials by Ellen Craft-a-Board: Thinner than Inchie Art Squares but thicker than usual chipboard. Can usually be die cut with simple large shapes. Great for making your own art journals or other types of books/photo albums. Soft white color can be customized with inks, watercolor, or airbrushing. Crinkle Ribbon: Pretty dyeable (or just color it with your Copics!) 1/2" soft silky ribbon that can be crinkled, for a vintage or distressed look. Ranger Inkssentials Manila Tags: Nice smooth surface that takes ink and dry embossing well, without cracking. 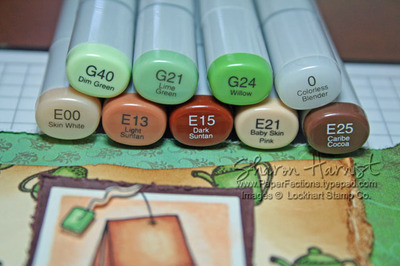 Copic Markers: My favorite marker of choice (if you didn't know that by now!). Alcohol-based, which means they are permanent on most surfaces, blend superbly without streaking, can be airbrushed, refills can be used for fun alcohol ink-based techniques. 358 colors! Peerless Watercolors: Extremely and beautifully vibrant, easy-to-use, great color range, portable watercolors that flow onto paper effortlessly, with wonderful results! No colors are repeated in their different packs, so you can build up your collection. Ranger Watercolor Cardstock: High quality, smooth surface on one side (good for stamped images), typical pebbled watercolor surface on the other side. Sturdy and holds up well to lots of water. Waterbrush: These are paint brushes with water reservoirs built into the "handle" so you don't have to continually dip the brush into water. They make it very easy to take your watercolor projects anywhere! Ranger Super Fine Detail Embossing Powders: Detail powder that keeps even the smallest, thinnest lines and details crisp; always performs well. Sizzix Big Shot: The Big Shot machine has always performed perfectly and effortlessly for me -- This is why I have not been able to justify getting the larger 9-inch PLUS machine that has been on my wish list for a year (takes 8-1/2" x 11" paper)! Maybe someday soon . . .
Sizzix Magnetic Platform: Holds your dies in place and keeps them from shifting in your Big Shot. Metal Adaptor Plate: A metal shim for your die cutting sandwich which helps apply more pressure, to get good clean cuts from intricate dies or larger dies with more cutting surface. Taylored Expressions Dies: I love that this company is a small family-owned business which has continually puts out new, innovative die concepts that are high quality and made in the USA! My favorites are the Cutting Plates -- they make quick and impressive looking backgrounds for cards or scrap pages. Glitter Ritz Microfine Glitter: There is always room for glitter on just about any project, in my opinion! This glitter is super fine and soft, which means it covers extremely well and opaquely, and is very soft to the touch so it won't scratch skin. Comes in a huge range of gorgeous colors. Lawn Fawn Hemp Cord: Nice, thick cord in traditional "baker's twine" with a stripe of color or silver/gold metallic thread through it, and solids. String by the Spool: A pretty thick metallic cord (silver or gold) which ties and lays nicely, adding a touch of elegance to any kind of project! Sequins: They come in fabulous colors, different sizes, and add pretty sparkle to any project. I always have clear and white on hand, so I can custom color them to match any project, with Copic markers. Wink of Stella Glitter Marker: Easily adds a beautiful, soft shimmer to stamped images that won't rub off and is undetectable to the touch. My favorites are clear, silver, and gold, that will go with most anything. Memento Ink Pads: They are Copic-friendly, permanent dye ink which stamps cleanly and smoothly ... 'nuff said! Distress Ink: I love these for their blendability and any kind of inky technique. They double as my FAVORITE watercolor medium! Versamark: Always a great dependable ink to use with heat embossing, or to leave a tone-on-tone watermark stamped image on colored cardstock. Delicata Ink Pads: Rich, thick beautifully opaque metallic colors that stamp very cleanly/nicely and dry FAST! My very favorite gold ink, EVER! The silver is gorgeous as well. Archival Ink: Waterproof and permanent, the deepest richest black ink I've ever found! Stamps very crisply. 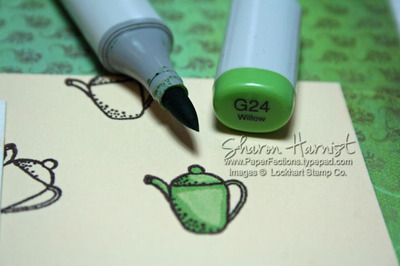 X-Press It Blending Card: Copic-friendly, with a very smooth surface. Great for Copic coloring or airbrushing. Neenah Solar White: The 80 lb. 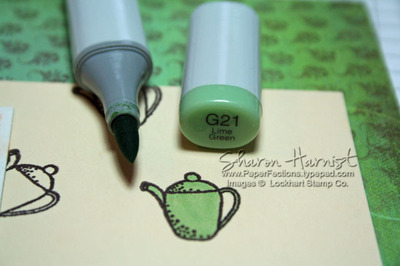 is my go-to cardstock for stamping. It is very smooth and yields great results for just about any technique you might throw at it! I LOVE the 110 lb. for card bases or larger die cuts -- it is so substantial, you will think you have two pieces of it stuck together! Neenah Desert Storm: My favorite kraft colored cardstock! Very smooth and not too heavy (80 lb). Crafter's Companion Shimmering Cardstock: Very pretty soft shimmery metallic colors. Core'dinations Cardstsock-Distress Collection: White core (or kraft) cardstock great to use with embossing folders, then sand away the top of the embossed image to reveal the white or kraft colored core, for a distressed/vintage effect. Essentials by Ellen: I love Julie's fresh and funky/humorous style, with beautiful and trendy fonts! Made in the USA. Taylored Expressions: Same reasons as for their dies listed above: small, family-owned, made in the USA, with several different illustrator styles that range from faith-based to elegant to cute. Wide arrange of scrapbooking related stamps, too. Red rubber cling mounted. Pink Ink: This is the company that purchased Lockhart Stamp Company and still produces and distributes Lockhart stamps. The owner is a renowned children's book illustrator and has a very similar whimsical style to Karen Lockhart and adds to her collection quarterly. Images are great for coloring enthusiasts and stamps are red rubber on wood blocks, made in the USA! Ellen is one of only two online retailers that carry these stamps. Hero Arts: I love their sentiment stamp sets -- they are packed full of different style options for any occasion you may need. Paper Trimmer: This trimmer is the updated version of the same brand I've loved and used since I started papercrafting (about 20 years ago?!!). I finally broke down and updated to this version (even though my old one is still going strong and serves as a secondary/backup on my die cutting table!). It cuts very precisely and straight -- I love the positioning wire on this updated version, which shows you to see exactly where your cut will be. I also love that for basic A2 cardmaking sizes you don't have to open the extension arm in order to make those common cuts (timesaver)! Ink Blending Tool: I love these newer 1" rounds -- they don't leave the straight lines on your ink blending that the rectangle ones sometimes can. They are high quality, hold up extremely well, and I don't think I have ever thrown one out because it fell apart! Teflon Bone Folder: Another tool I didn't think I needed (because I already had a different type), but is now a must-have! I like that it has a square angled end in addition to the pointed end. Doesn't leave shiny marks on your cardstock that other types of bone folders can. Sparmax Airbrush Compressor: Expands the use of your Copic markers, making them usable on just about any surface! And a BONUS exclusive "totally fabulous" die set! How fantastic is that?!! All you need to do to be entered into my giveaway is leave a comment on this blog post (ONE comment per person, please) telling me your favorite product on your wish list by Friday, December 11 at midnight Central and I'll let Random.org choose the winner! Please be sure to leave your email address, so we have a way to contact you. Thank you all so much for stopping by . . . I appreciate each and every one of you!! With the official start of the holiday season today, I am celebrating over in the CLASSroom with this build-a-scene card and Taylored Expressions dies, combined with a beautiful Essentials by Ellen Mistletoe & Holly stamp set ... I hope you will join me there for all the details! Ellen Hutson LLC is thrilled to be celebrating their online store's 9th year! The celebration begins on TODAY (Fri, Nov 27) with special savings and will continue with inspiration and chances to win some fab prizes through December 12th as we host our annual 12 Tags of Christmas with a Feminine Twist (my absolute favorite project of the year)! For nine (9) hours beginning at 12:00am Friday, November 27th Pacific Standard Time (3:00am Eastern Standard Time), running through 9:00am PST, save 20% on every item currently in stock. If you are not an early bird, you can enjoy savings of 15% on all in stock items any time over the weekend - Friday, November 27th through Monday December 1st at midnight PST. Didn't finish your shopping? You have one more chance to get great deals on remaining inventory while shopping in your pj's. Enjoy savings of 20% on any remaining in stock items on Monday, November 30th beginning at 12:00am running through 9:00am PST. <== Click on the Stamp-N-Storage graphic to start shopping! They have increased the value of our Storage Rewards program for the entire weekend. With each purchase from Stamp-n-Storage, you'll get 50% more Reward Points! You don't want to miss out on this! Free shipping is available on all orders in the Domestic US! That's right, not only do they have great discounts on their products, you'll get them shipped to you for free! Welcome to the 5th day of My Favorite Things July Release Countdown – just 2 days left until the new products are available on July 8! Be sure to head over to the MFT Blog to see today’s full product reveals AND enter for your chance to win a $75 gift voucher on each of the 7 countdown day blog posts! My project today is one I've been meaning to create for a few months now. Since I've started doing a lot more die cutting, my cardstock scrap pile has gotten out of control! To help get the pile under control, I started trying to keep the scraps separated in this photo storage box. But there weren't enough dividers that came with the box, so I was just tossing the scraps anywhere ... ugh! YAY! Did you hear that huge sigh of peaceful organized bliss? :) Usually whenever a piece of cardstock ends up 1/4 sheet or less, it will go into this box. The box sits right next to my Big Shot, so it's easy to reach in and grab whatever color I need AND to quickly file away extra pieces after I've been die cutting. 1. Trim inexpensive 65-pound weight white cardstock to 7.25" wide (leaving it 11" long). 2. Score lengthwise at 5.50" and fold in half to create the "file". I varied the position of the center tab die (either dead center, to the far left or far right), to create 3 different positions of center tabs. 5. Die cut MFT's heavyweight colored cardstock with 1-1/2" x 5/8" rectangle die from Blueprints 14 (use up some of those scraps!). Adhere the colored cardstock rectangle to the front file tab. (You may have or find another rectangle or tab die that will work just as well -- this is just what I found on hand that worked. You need a rectangle about 1.50" wide). OR You could always just skip this step and make your whole file folder out of MFT's colored cardstock. If you choose to go this route, the Heavyweight Cardstock Sampler is a great way to get a sample of each of the 43 beautiful colors! These File Folder Edges also make darn cute cards . . .
And then I placed the Copic dots of color over the shading. She was popped up on a Blu Raspberry Pinking Edge Circle STAX. The background of the card front was embossed using the Cloudy Day Stencil and Embossing Pad Combo. Then while the stencil was still covering the cardstock, I sponged Sweet Tooth Pigment ink through it to color the clouds. Below you can see that great tabbed file folder edge. The Birthday sentiment is also from the Happy Banner PI stamp set. Some more of my colored Translucent Vellum (<--Tutorial link) was die cut with the new Balloon STAX, embroidery floss "tied" to them and anchored under the PI girl's hands. I love that you can see the clouds through the balloons! Thanks so much for stopping by … I'll be back late Monday night with some more July release countdown inspiration! I like that this binder will close up for travel, so no dies can accidently escape! These smaller binders are available from JustRite Stampers as well as the smaller plain/unprinted white cling storage panels (measuring 8-1/2” x 5-3/4”)! The same business card magnets were cut and used wherever needed, to hold the die configurations. I like using pieces of magnets (as opposed to full sheets of magnets), so it’s easier for my acrylic nails to get the dies off the magnets! I hope this may help some of you with the same storage challenges! I'm a very happy crafter now, with plenty of room for the whole line of Copic Sketch markers (334) PLUS the 24 Spica Glitter Pens! These make my markers easy to access, right in front of me on my desk -- since I use them on just about every crafty thing I make! Remember, you can purchase the "towers" individually, to match up with the amount of storage you need. For a size comparison, here's a full-sized Memento ink pad -- it's about the size of one of the little cubbie openings. You may wonder what I'm using my old storage for now? My QuicKutz Magpie unit on the left is now holding ink pads within easy reach: Memento full-sized and Dew Drops stored in QuicKutz die containers (color coded with buttons on the front), Ranger Distress ink pads, and adhesive in the drawer. You can also see here how many more markers the Color Cubbies can hold vs. one Magpie. I hope the photos help you make your Color Cubbie decisions! "It looks like you had a lot of fun! Thanks for the chance to win!" Congratulations, Melissa!! Please email me your glitter pen set choice and your mailing address (using the link under my photo) and Copic will send your bunch of glitter goodness right out to you! I'm always looking for the perfect storage solution and Studio 3 Solutions came to my rescue! They sent me their new Color Cubbie to try out and I absolutely love them! 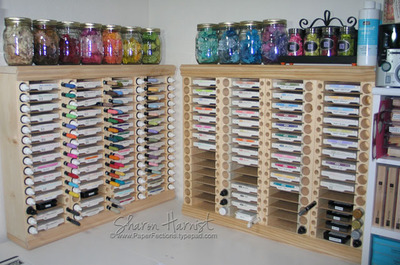 Company owner, Tami McBeain, is a stamper & papercrafter just like you and me and when she found herself needing some storage for her Copic markers, she took her ideas to her husband (who has been a custom cabinet maker for 27 years!) and the Color Cubbie was born! What do I like better about the Color Cubbie than my old storage? #1 Space. ONE Color Cubbie takes up LESS space than the footprint of TWO 36-marker cases! Each Cubbie tower is 4.25" wide and 14" tall. Tami says one Color Cubbie tower will hold 24 markers per shelf, 120 per tower, but as you can see I crammed a few more into some of my cubbies, LOL! #2 - Slanted Deeper Shelves. Tami designed the shelves to be slightly angled (tipped up in the front), so the numbers on the ends of the makers are easier to read AND this prevents all of the makers from coming tumbling out when you grab one from the bottom of the pile (this was constantly happening to me with my old storage)! The Cubbies are also deeper -- 5.50", allowing 1/2" of your Copic Sketch marker easy to grab on to. #3 - Customized Storage. I love that you can customize exactly how much storage you need by adding more Color Cubbies as your collection grows! And with the small size, they'll fit just about anywhere, in any configuration you'd like! I really like this type of shelving storage better than the plastic marker cases the markers come in -- it drives me crazy to try and get the markers back into those tiny individual holders and keep them in numerical order! The only thing I found wrong with these two Color Cubbies is that I need two more of them to hold the rest of my markers and I've already ordered them!! :D I'll be sure to show you my full set of storage once they arrive! You can read more about the Color Cubbie here at Tami's blog and you can purchase them here. Tami says she's working on more storage solutions and I can't wait to see what she comes up with next! These are Quickutz Magpie Nesting Storage System (I'm using three of them) that I've been using for about 18 months now. They are wooden and originally meant to store Quickutz dies in the metal tins you see in the last two columns to the far right (I use the tins to store my Memento Dew Drops and color coded the fronts of the tins with colored buttons). They come in either white or black and Overstock.com usually has them in stock at a good price ($21-23). These are lined up along the back edge of my crafting desk, so they are right in front of me within easy reach (I took the photo from where I sit to stamp). I use a different cubby for each Copic color group. As you can see to the far left, the cubbies are also a good size to store Ranger Distress Ink pads, Memento full-sized ink pads & Palette ink pads. I took the drawer out of the bottom of the left unit and it sits on top of the unit, to hold odds & ends. I also have a friend who turned her units upside down, so the drawer is on the top (just take the drawer out and flip it over). I love these because clean up is quick & easy -- just throw the markers back into their respective cubbies! I use my COLOR CHART to select which colors I want to use, then I can easily find them in their cubbies. It seems I'm constantly organizing things in my studio, trying to find the best/better storage solutions. I recently reorganized all my ribbon and promised friends some photos, so here you go . . . I love these Embellishment Centers by Making Memories (I've never ordered from the site linked above, it's just the first site I found when I Googled these. For some reason, Making Memories doesn't have them listed on their site). This is the larger one that measures 24" wide x 31.5" tall. It hangs on the wall in front of my desk (the ink pads in the lower right of this photo are sitting on my desk). It has cubbies to hold jars of ribbon and also Crop In Style's Ribbon Spool Stackers (again, I have no affiliation with this site -- I just wanted to find a better photo for you). 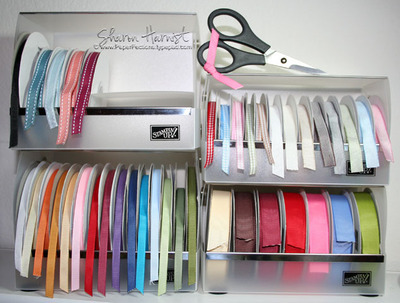 I've found my ribbon stackers at Michael's or Hobby Lobby and the Embellishment Center at Michael's -- use your coupon! I've tried to organize by color: reds, oranges, yellows and white/cream are in this center. The jars usually contain the same type variety -- wide satin, polka dot, swirls, velvet, etc. that I've gotten from the same source . . . that's just how my head organizes things! So I know if I want a polka dot, I can go to that jar and find the color I need. On top of my ink pad holders is Stampin' Up's ribbon in their holders, along with my scrap ribbon jar. I stick all kinds of small scraps in there -- you just never know when it will be the perfect piece for your project! Okay, don't gasp . . . but I have another smaller Embellishment Center on another wall! It measures 27" tall x 18" wide and houses greens, blues, violets and dark neutrals (black/brown). It hangs on the wall next to a wall of storage I created with my Store in Style cubes from Crop in Style . . . I'll show you those at a later date when it's organized a little better! Look, I have one empty jar left! Can you tell I love ribbon?!! So how do you store yours? I'm always looking for new/better solutions! You know the Friday drill . . . Beate's Weekend Sketch Challenge! Here's the sketch for this week. 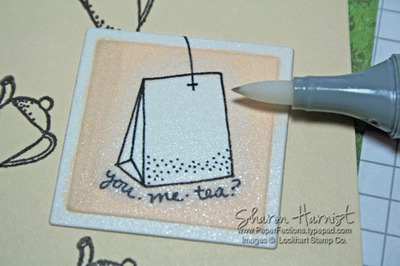 I decided I was in the mood for shabby & distress, and looking through my Lockhart stamps I found this new Itty Bitty Teapot that I thought would work well as a background stamp for the Teabag. I knew I wanted to work with browns on the teabag, so I chose this Memory Box Inspire printed paper that has a brown pattern in it. 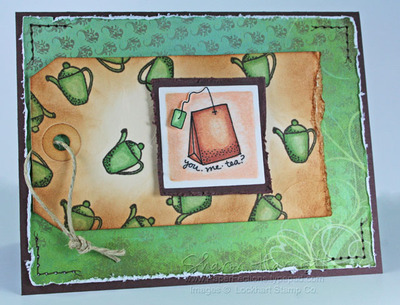 Next, I stamped the teapot all over a manila tag (5-1/4" x 2-5/8") with Ranger's Adirondack Espresso dye ink. 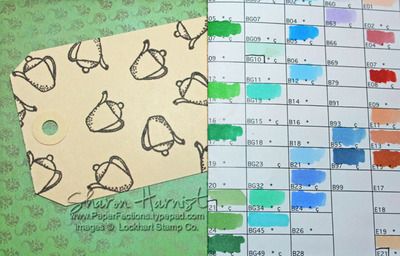 I knew I wanted to color the teapots with green to match the paper, so I got out my Copic color chart and matched up the greens. 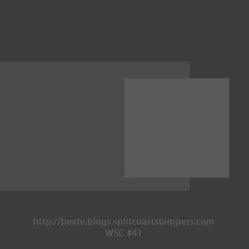 (Edited: this blank color chart is now available to be downloaded from this post). This is a cabinet for storing dies (by QuicKutz). It measures about 14" tall x 10.5" wide x 4.75" deep. The markers stick out about 1.50" -- just perfect for grabbing! I have my markers separated by (L-R): Blue/Blue-Violet, Red/Red-Violet, Yellow/Yellow-Red, Green/Yellow-Green, Blue/Blue-Green, Earth, Neutrals, Grays, Blenders. It sits right in front of my work space, within easy reach. I find this system works very well for me: I use the color chart to choose the colors I want to work with, then pull them out of the cabinet. When I'm finished, clean up is a breeze -- just toss them back into their individual cubbies and I'm done . . . no more worrying about keeping them in order! Then I went back with a lighter G40-Dim Green (shown in the very last photo below) and softly blended the two together. I'm happy to report this combo of ink with the coated manila tag worked very well with the Copics -- no bleeding whatsoever! 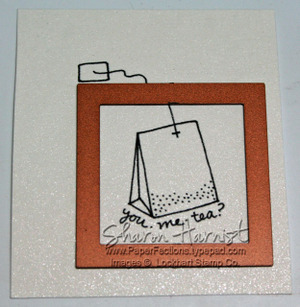 For the teabag, I decided I wanted to cut the image with a smaller, square die (Spellbinders Nestabilities Classic Square) instead of the usual rectangle shape you would probably normally use to cut out the whole image (and so I would stay within the sketch guidelines). But this left me with the string and tag of the image being cut off. We'll get back to that later! So I went ahead and die cut/embossed the image. I cut out the rest of the teabag's string & tag and mounted it on a tiny bit of pop-dot. 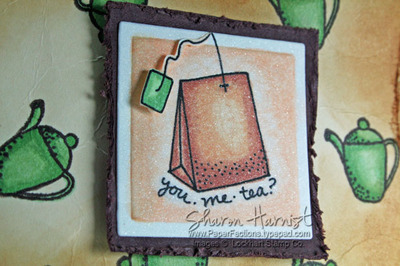 The tag was crumpled and it and teabag were mounted with dimensional foam tape to the card. The corners of the card were faux stitched with dark brown marker and a paper piercing tool. This photo is a good indicator of how you should choose your Copic markers if you are just starting to collect them: about 2 or 3 shades within a color family. You'll notice the greens are a few depth-of-shades apart (indicated by the ending number of the color code, in this instance 0, 1 & 4. 0 being the lightest shade and 4 being darker). The first number of the code is the clarity of the color -- the smaller number being the more true/pure color of the spectrum (in this case, the 2's), while the 4 has a little more gray in it. Selecting your colors this way will allow you the ability to shade images for a very natural look, with a lot of impact! Be sure to also check out the blogs of Cambria Turnbow, Charmaine Ikach, Jenn Balcer, Laurie Schmidlin, Lori Craig and MaryJo Albright -- they'll have some awesome samples, I'm sure! I hope you have a lovely spring weekend wherever you are. The trees and grass are blooming here in Texas and I'm coughing & sneezing my head off (seasonal allergies)! A New Stampin' Up catalog year brings new accessories, and one of my favorites is ribbon! This year I finally decided to purchase these stacking ribbon holders Stampin' Up! started carrying last year because I was running out of ribbon storage space (can you sympathize with me here?)!! I wanted to segregate my current ribbon from the retired (and add new!) and keep it within easy reach, right on my desk top since I'm always getting it out for just about every project. These plastic containers seemed innocent enough when I started assembling them. They went together quickly and easily -- they are shipped flat and just bend and snap together. But before you can snap the final piece in place (the front part that has the logo on it), you have to be an acrobat to get all the spooled ribbon to stay inside the semi-enclosed box while you insert the included figure-8 piece that locks two or more of these containers together, then snap the final piece in place. And then try to do all that again with the next unit you want to stack and attach to the first! One nice thing about these containers is that the ribbon rolls fit in snuggly (top to bottom, when the proper size of container is selected for your ribbon roll) but when full, you must open the front of the container in order to change an empty roll or take one with you. And somewhere in the assembly process, I ended up with a thin paper-type cut on my thumb from the edges of the plastic -- owie! That being said, I like how well these containers stack and they seem plenty sturdy. I wouldn't suggest stacking more than three of them though. I tried stacking all four of these together but it was a little too wobbly for my peace of mind. I also like that the ribbon is well-contained but easy to unroll -- some of my other non-SU containers have such tight fitting lids that the ribbon won't unroll easily. Other bonusus included in your purchase are the black rubber bumpy "feet" you can stick on the bottoms of these boxes to prevent slipping/furniture scratching and a plastic insert to fill any horizontal empty space so your spools won't fall over. I have two large units stacked on the left and two mediums on the right. The Stampin' Up catalog suggested the medium box for its new double-stitched ribbon but I found it fit a bit too snug (top to bottom) to be able to still turn/unspool easily, so I put it in the large container. Maybe that's also the reason the SU catalog photo shows the double-stitched ribbon in the large container, too <wink>! So if you have (or want) all the Stampin' Up ribbon and want it to fit nicely into these containers, these are all I would suggest. I don't see a need for the small units, as the catalog says they will only hold the new taffeta ribbon. TIP: Designate one pair of paper snips as your ribbon-only scissors (by tying a piece of ribbon around the handle) and do not use them for anything else. They'll stay sharp and cut your ribbon beautifully! Now hopefully I'll still have room left for that yummy wide satin ribbon (chocolate & pomegranate) and metallic (gold & silver) elastic cord we Demonstrators just got to preview in the upcoming Stampin' Up Holiday mini catalog! It will begin mailing to customers around August 15 (you can begin ordering from it Sept 1), so watch your mailbox! These great ink pad/reinker/marker wooden storage units I have are on sale this month at Storage Units Ink (SUInk). Denise is running 10% off her entire store in July, so if you've been hesitating to get these, now's the time! Especially with those new Stampin' Up! In Color ink pads you have on order that will be arriving soon -- you'll need extra space to store them!